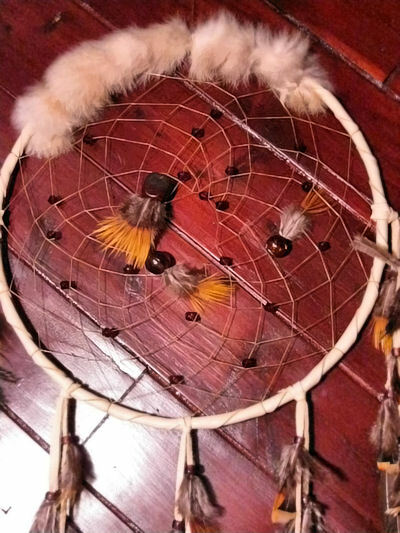 This dream catcher is wrapped in genuine leather and real rabbit fur. It has many fine crystal bicone beads in the web, along with larger focal beads. We make this dream catcher for you by hand to your specifications when you order it, so allow about a week for construction time. NOTE: Lengths given are approximate and may vary a couple inches, depending on your feather choices. The picture shown is the 12" size and is representative, the one you receive may vary slightly. This dream catcher is available in a variety of leather colors, bead colors, and feather choices. Additional large feathers can be added to each fringe with a brass or silver cone for an additional charge. The feathers are held on with glass crow beads (amethyst color shown). If you have a preference for particular crow bead colors on the fringes, leave a comment in the comment box of your checkout form. 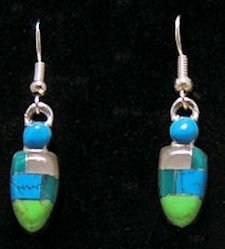 You can use more than one color for the crow beads, if you wish. We have all the colors shown in our Crow Beads craft supply section. You can also see pictures of the available leather colors and feathers in our craft section. This dreamcatcher can be shipped internationally. However, check to be sure feathers can be imported to your country. We are not responsible for items seized by customs. Feathers of any kind cannot be shipped to New Zealand, however, we can send a dreamcatcher without the feathers. This product was added to our catalog on 11/02/2010.